Flowers are left at the cordon near the tent covering the park bench where former Russian intelligence officer Sergei Skripal and his daughter Yulia were found poisoned in Salisbury, Britain, March 19, 2018. 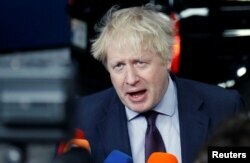 British Foreign Minister Boris Johnson told his European Union counterparts at a meeting in Brussels Monday that Russia's denial of its involvement in the poisoning on British soil of a former Russian spy is "a classic Russian strategy of trying to conceal the needle of truth in a haystack of lies and obfuscation." Johnson said Russia's continued denial of its participation in the nerve-agent poisoning of former spy Sergei Skripal and his 33-year-old daughter, Yulia, is "growing increasingly absurd." Britain's Foreign Secretary Boris Johnson talks to the media as he arrives at an European Union foreign ministers meeting in Brussels, Belgium, March 19, 2018. Johnson added that "technical experts" from the Organization for the Prohibition of Chemical Weapons will be in Britain Monday to take samples of the poison. As the dispute between Britain and Russia continues to mount over the poisoning of Skripal, the Kremlin announced the expulsion of 23 British diplomats and Russia’s foreign ministry came up with yet another theory about the origin of the toxin used. Russia’s Foreign Ministry listed four European countries as the most likely source for the Novichok nerve agent British officials say was used. Topping the list was Britain itself — the other three, Slovakia, the Czech Republic and Sweden. In an interview with a Russian state broadcaster on the eve of Russia's presidential election Sunday, Foreign Ministry spokeswoman Maria Zakharova suggested all three states, along with Britain, had been “carrying out intense research” on Novichok, but she offered no evidence for her assertion. Swedish Foreign Minister Margot Wallstrom said Monday the suggestion that Sweden has stockpiles of Novichok is "just ridiculous and totally unfounded." She said, "I think that they are trying to make some kind of diversion from the real issues here." German Foreign Minister Heilo Mass said, "All the information we have suggests that there is no alternative plausible explanation to the Russian side bearing a share of the responsibility." 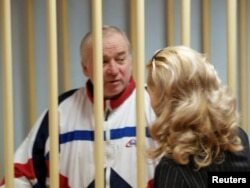 FILE - Sergei Skripal, a former colonel of Russia's GRU military intelligence service, looks on inside the defendants' cage as he attends a hearing at the Moscow military district court, Russia, Aug. 9, 2006. With the rupture worsening between Britain and Russia over the nerve-agent poisoning of Skripal and his daughter, who were found slumped and unconscious on March 4 in a sleepy English cathedral town, British Prime Minister Theresa May is being urged by British lawmakers and analysts not to hesitate to seize assets invested in Britain of Russian plutocrats tied to Russian leader Vladimir Putin. Among property that should be targeted, say lawmakers eager for an immediate response to the expulsion of British diplomats, is property owned by companies registered to Russia’s first deputy prime minister Igor Shuvalov and the London house worth more than $150 million of oligarch Roman Abramovich, owner of Chelsea soccer club. The Kremlin’s announcement Saturday of the expulsion of British diplomats had been the expected like-for-like response to the British government’s expulsion earlier of the same number of Russian diplomats. Last week, the British Prime Minister unveiled a raft of reprisals for what London says was a Kremlin-approved assassination attempt on Skripal, a double agent Putin vowed publicly once to kill, and his daughter. British officials say father and daughter remain in critical condition. A policemen who was among the first to try to help the pair is still in hospital but is now in stable condition. British toxicologists say Novichok was used in the assassination attempt.